Please note that the features described on this page are only available to subscribers. You can try them out for a week by clicking the button “Start free trial” on the “Synchronization” page. SuperSaaS offers different ways to connect your appointment schedules to other online calendar programs. 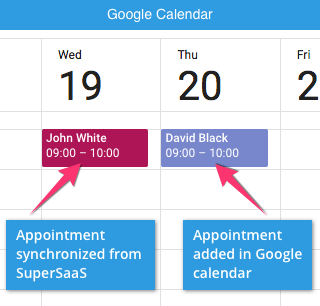 You can let your SuperSaaS schedule depend on availability in your Google Calendar. 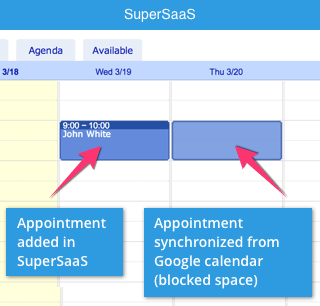 And you can publish appointment information in your SuperSaaS schedule to another calendar program, such as Google or Outlook. 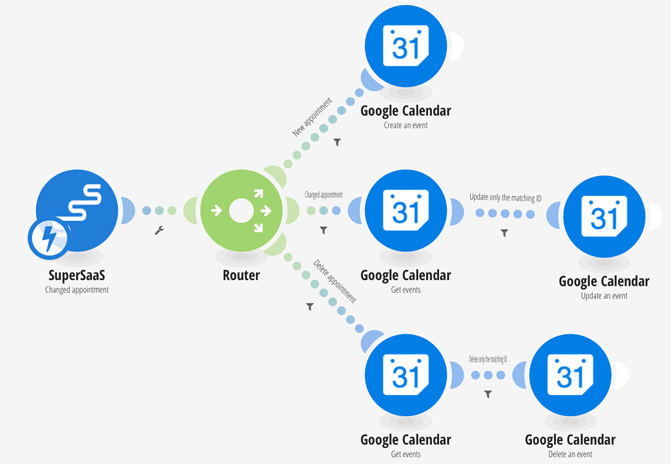 SuperSaaS is able to connect directly to Google Calendar and use its free/busy information to determine your availability in SuperSaaS. If you want to use the free/busy information from a program such as Outlook, you will need to set up a sync from Outlook to Google Calendar first. When you link a Google Calendar to a SuperSaaS schedule, appointments in your Google Calendar will be marked as unavailable in your SuperSaaS schedule. This way, customers can only book when both your personal calendar and your general opening hours allow them to. Only the free/busy information will be synchronized, so your customers will not see any of the details from your personal appointments. Using this type of Google synchronization can also be useful if you want to define complex opening hours. You can create a complex pattern of repeating appointments in Google Calendar that leave your desired opening hours available. In your Google Calendar, hover over the name of the calendar with your mouse and click the three dots that appear. Choose Access Permissions in the menu on the left. Tick the checkbox Make Available to Public and select See only free/busy (hide details) option. Scroll down to the Integrate Calendar section and copy the calendar ID as shown below. If you have only one Google Calendar, the ID is probably equal to your email address. On your SuperSaaS dashboard, navigate to Supervise > Synchronize. Here you can now fill out the calendar ID. The software will verify the connection upon clicking Save changes and a message at the top of the screen will indicate whether the connection was established successfully. Once this is set up, the SuperSaaS system will regularly check your Google Calendar for updates. The frequency with which the availability information from Google Calendar is updated depends on how often your schedule is accessed. Whenever someone uses your schedule, the system evaluates whether its copy of your information is older than 15 minutes and if it is it will update the information. This update process can take a few seconds and it may take a second page refresh for the updated information to display. This should not be a problem for users, since they always use more than one page before they can make a booking. Updates are retrieved up to 5 months into the future, so you may want to ensure your users cannot book further in advance. If you want to put an appointment in your Google Calendar that you don’t want to show up as unavailable in SuperSaaS, you can click Edit event details in Google Calendar and select the option Show me as: Available. If you want to still be able to make appointments yourself during busy times on your Google Calendar, then check the Allow the administrator to ignore time constraints option on the opening hours tab. Ensure the time zone is set correctly, both in Google Calendar and in SuperSaaS. Time zones do not have to be the same on both calendars, but times will be translated as appropriate if the time zones differ, so you should make sure that such a translation happens intentionally. To let your SuperSaaS availability depend on your Outlook calendar, you will need a third-party sync program to establish a sync between Outlook and Google Calendar first. Google Calendar is free to use and easy to set up. So you do not need to actively use Google Calendar to manage your schedule, you can simply use it as a bridge between Outlook and SuperSaaS. You only need to sync the Outlook calendar with Google, there is no need to sync any contacts and tasks. After you’ve set up the sync between Outlook and your Google Calendar, set up the sync between SuperSaaS and Google as described above. Once the sync program has completed the initial sync, busy times from Outlook will be blocked on your SuperSaaS schedule. You can also publish your schedule to any calendar program that can subscribe to an industry standard iCal feed, such as Microsoft Outlook, Apple’s iCalendar. The iCal link is one way; when you change something in your SuperSaaS schedule, it will be reflected in, for example, your Outlook calendar after it has synchronized. Keep in mind the appointments cannot be edited in Outlook. You can also use the webcal link to show your bookings on the calendar of your mobile phone. The mobile version of our website (m.supersaas.com) is however generally a better choice as it lets you edit appointments too. 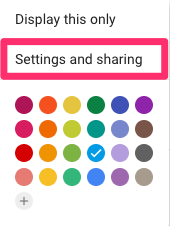 If you use Google Calendar, then you would need to go to the Settings of your main calendar and click on the Add Calendar section on the left side of the page. You can now select From URLoption and add the webcal link. On a subscribed calendar, the data is kept separate from the other appointments on your calendar; on a Google Calendar this is the other calendars section. It is not actually merged, so you can easily delete it again without affecting your other appointments. If you want to merge the appointments from your SuperSaaS calendar with those of your calendar program, then you can download them via Supervise > Download and upload them into your calendar program. In that case, however, the appointments can no longer be automatically updated. A middle ground is to have the SuperSaaS system automatically send you confirmation emails with a small iCal attachment each time an appointment gets made. This allows you to add the appointments to your calendar with one click. You can add an iCal attachment by including the magic word $ical to your email confirmations. The frequency with which the data is updated depends on the calendar program used, not SuperSaaS. The iCal protocol is quite inefficient as it requires the transfer of all calendar data for each update. This makes that most calendar programs choose not to update too frequently. Also, the iCal protocol only allows for a limited number of data fields to be sent across. This means that none of the custom fields you have defined in SuperSaaS will be transferred. Note that the frequency with which Google Calendar updates the information is not under our control and can take several hours. There is a quicker way to sync Google outlined below. Updates to most other programs, such as Microsoft Outlook, should take about half an hour when default settings are used. The iCal interface does not provide authorization measures. If you are concerned people might find out your webcal link and use it without your knowledge, you can block it. On the Configure > Access tab, near the bottom of the screen you can select Block access with calendar programs. After selecting this option synchronization via iCal will be disabled. The regular iCal integration of SuperSaaS with Google Calendar is relatively slow, it only syncs once or twice per day. Google controls the update speed and this is not configurable. To get around this, you can use a webhook to modify the appointments on your Google Calendar almost instantly when the change occurs on your SuperSaaS schedule. This includes reflecting deleted or changed appointments in your Google Calendar. An added benefit is that you can customize exactly what information gets sent across so you could, for example, display appointment price information from SuperSaaS in your Google Calendar. Manually configuring a webhook would be complex, but there are third-party websites that can do the work of setting up a webhook automatically. In particular, Integromat.com and Zapier.com provide templates that allow you to set up the link between SuperSaaS and Google Calendar (and many other services) with a few clicks. Our developers have created templates for both Integromat and Zapier for you to use to ensure that updated appointments in your SuperSaaS schedule are instantly updated to your Google Calendar. 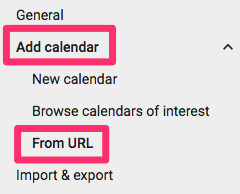 If you make changes to or delete an appointment, these actions will also reflect in your Google Calendar. While the templates can be used as is, you can also expand and customize them to suit your needs, for example by modifying the fields that get copied.